Attendees at the check presentation ceremony. From left to right: Todd Luft, vice president, branch banking administration manager; Don Cross, vice president telecommunications lead and veteran, Associated Bank; Amy Luft, Stars and Stripes Honor Flight; Rick Siefert, Vietnam War veteran; Neil Mertz, Korean War veteran, Walt Raebel, WWII veteran; Vicki Betts, vice president, senior project manager, Associated Bank; Stu Betts, Desert Storm conflict veteran; Tanya Schulteis, associate vice president, Grafton bank manager, Associated Bank. The Associated Bank branch in Grafton, Wisconsin recently presented a $1,025 check to Stars and Stripes Honor Flight. For the past six years, Associated Bank branches display photos and military mementos in their lobbies throughout the month of November to honor our country’s veterans and active-duty military personnel around Veteran’s Day. The branches with the top displays receive funds to donate to a local veterans’ organization. The Grafton branch was one of the award recipients from their branch display. The mission of Stars and Stripes Honor Flight is to honor all veterans by flying WWII, Korean and Vietnam War veterans, as well as terminally ill veterans from other conflicts, to Washington DC to visit their memorials. 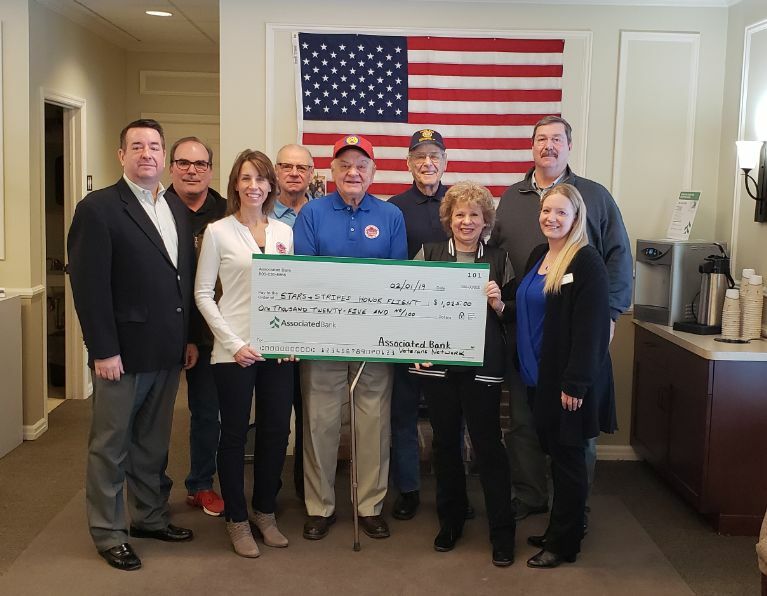 Associated Bank is committed to supporting veterans and military personnel within our business as well as our communities. View more about our veteran and military benefits at http://careers.associatedbank.com/veteransandinstructions.aspx.